Anyone over the age of 40 knows the struggle of getting up and going to the toilet and making it back without having any slips or accidents in the process. Growing old changes, a lot of things, including your bathroom breaks. 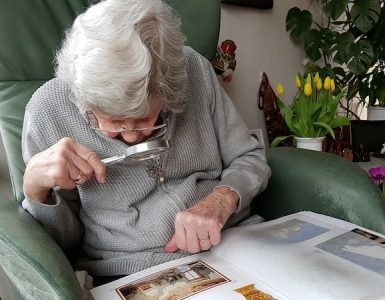 Elderly people with back or joint issues will have issues when it comes to using the bathroom, and they need just a little extra support to get them to where they need to be. That’s not something to be embarrassed about though. There are various options nowadays to help you with your pain or posture, and going to the toilet can be much easier with a handicap toilet seat with handles so you don’t have to worry about ever hurting again. This article should assist to clear up any and all questions you may have regarding the right toilet seat for elderly, and then you can choose one from best toilet seat with arms picks of 2018. What is a handicap toilet seat with handles? For people with restricted mobility because of pain or discomfort, bending can be extremely hard, resulting in a greater risk for falling. Handicap toilet seats raise the height of the toilet, minimizing the degree that someone has to bend to use the toilet. They’re generally easy to install so you do not need to waste money on expensive toilets or make costly modifications to your bathrooms. There are two main kinds of handicap toilet seats. The first kind is the riser, which is placed under your current seat of the toilet. The riser gives you a stable base to sit on, and it can be raised during cleaning. Top-mounted handicap seats are installed over the top of a toilet seat. Certain seats just snap into position, whereas others are fixed in position using brackets or bolts. Seats that are stabilized with gears need more effort during installation but usually, give more stability than snap-on. Some top-mounted handicap toilet seats come with grab bars on the sides that help with portability. 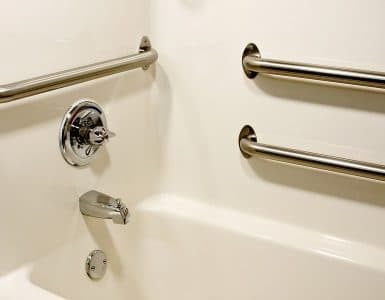 If you do not get a seat with handles, you might want to think about getting grab rails installed around your toilet to give more security while using the toilet. This product by Essential Elongated Medical Supply is a raised toilet seat with arms that increases the height of your toilet by a great deal while simultaneously providing elders the chance to use the seat of the toilet. It comes with removable padded arms that provide more security and comfort when somebody is getting off or sitting on their toilet. It comes in various sizes including elongated and regular options. 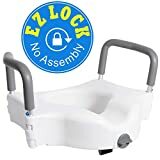 It is also inclusive of all necessary hardware that is needed for installing it under the toilet seat, along with easy instructions to complete the package. The whole thing is pretty easy and quick to install and can be completed in just under 20 minutes. It is definitely a preferred feasible option over unnecessary toilet renovations and modifications that just up to your other costs. Even the cleaning and maintenance is easy, you just need to give it a good wipe down every now and then. You may have to drill some holes in the top toilet seat to accommodate the seat’s large knots and bolts during installation, and you won’t be able to lift the seat itself for cleaning underneath. That said, it excels in almost everything else in terms of quality and safety. VIVE is a well-reputed health product brand that has been known to provide high-quality toilet products for elderly people across the globe. The Portable Elevated Riser with Padded Handles is just one of them. This amazing product doubles as a raised toilet seat for elders with a definitive design that is ideal for persons who require support while sitting down or getting off their toilets without any problems. 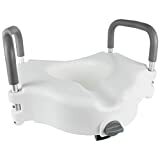 Its lightweight and compact design make it perfect for travel and storage, and the support frame is not like many other toilet seat models out there so any elder or handicapped person would be lucky to have this riser for their daily toilet needs. A beautifully designed product with inbuilt support handrails on both sides, this handicap toilet seat by Vaunn definitely is quite popular in the senior and handicap community. Not only is the brand a well-established company for medical products, but the Elevated Raised Toilet Seat is one of its more versatile options since it meets standard and elongated toilet requirements. That said, some folks do think its compatibility is a bit exaggerated. Another drawback that some folks choose to pinpoint is that the central opening is comparatively smaller than other models. Even so, the company makes up for these faults by making a seat with great quality, ideal sizing, and fitting, impeccable security, and safety, comfort and stability. One of the great things about this seat is the ability to clean it without too much hassle. However, it does fall in the pricier range of toilet seat products with all of its amazing features, designs, and quality. But, depending on your budget, this could end up being the best investment you make if you’re looking for good safety and security. The Maddak Elevated Toilet Seat – Tall-Ette is another raised toilet seat with arms great for most elongated and standard toilets. It is necessary for your toilet’s height to reach an optimal level of 17 inches so that the seat’s legs can settle on the floor. The seat itself is provided with comfy curved foam armrests that can help most elders using it when they wish to sit down or get up. It is perfect for persons who have to deal with poor balance or leg or joint weakness that affects their daily life. The toilet riser provides users with an extra 4 inches for the height of their toilet setup. If following installation, the riser’s legs do not reach the floor, all you have to do is get rid of some of the foam to make more room for the legs. The overall width of the seat comes down to 22.5 inches so it is recommended to analyze the size of your toilet so you can see if the product fits your setup before you buy it. The seat can be great by people who weigh up to 400 pounds with its supportive metal legs. These aluminum legs are capable of being adjusted to accommodate the height of your toilet. If you’re still not sure about the quality, you can avail the one-year warranty for replacement or customer service. This is a toilet seat that is great for heavier people. Carex Health Brands is a popular brand choice for medical products and services. Many individuals seem to praise the great durable nature of the company’s Toilet Seat Elevator with Handles. This product is designed using heavy-duty plastic that gives a clear and smooth finish, and also manages to be both comfortable to use and simple to clean and handle all at the same time. 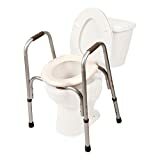 This seat comes with side support bars that numerous people can use easily since they are strong and supportive especially for those looking for a raised toilet seat for elders. One of the great benefits of the elevator is that it puts the individual in a properly supported posture to handle their toilet needs. Many folks love that the seat is generally easy to install, and has no problems with slips or wobbles once installed in the proper position. That said, some reviews say they have issues with getting an ideal secure fit. Still, this Carex Health Brands Elevator is a high-quality product you can get for a great price. 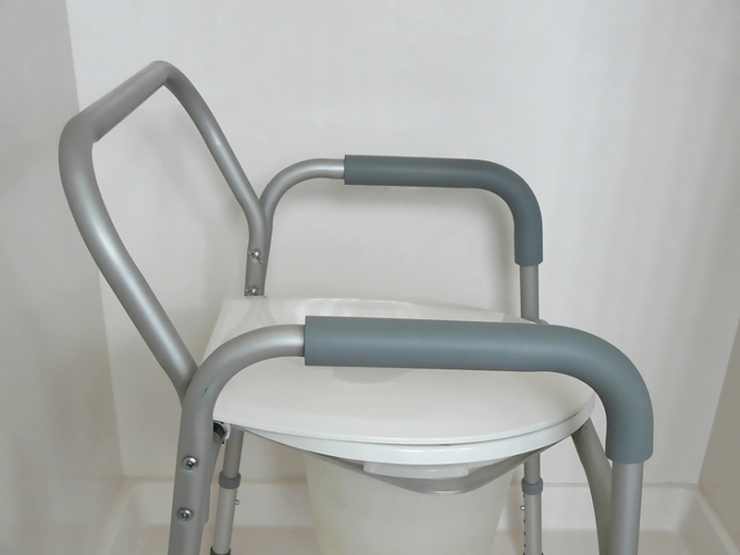 The PCP Raised Toilet Seat and Safety Frame is one of the few medical toilet options out there that gives you a safety frame for use in case of senior or handicapped Qindividuals who need extra support. The product features two functional necessities: it helps by increasing the seat height of the toilet as well as duals as a safety frame at the same time. This is great because elders get the advantage of getting their toilet seats elevated, while simultaneously allowing them to keep themselves safe when they’re using the toilet. The toilet seat has the capability of withstanding a weight of up to 300 pounds. You can get it completely assembled from the pack, so installation isn’t even a problem with this amazing product for elders. The seat itself is pretty lightweight so it’s relatively easy to move it out of the package to the toilet and you’re ready to use it. It has an overall width of 21 inches and a distance between the arms of 18 inches. The height is easily adjustable with distances ranging from of 18 to 23 inches, and it also comes with a 1-inch durable safety frame. The plastic molded seat doesn’t need a lot of expertise or equipment to clean, just wipe it and you’re good. With amazing silencer rings and vinyl armrests, it is definitely an ideal raised toilet seat with arms for most seniors. Handicap toilet seat installations are pretty simple. Lift both the seat and lid of your toilet. Turn the adjustment knobs of the handicap seat to loosen the bracket so that you can fit it fit onto the toilet. Position it over the bowl rim, snapping the back flanges under the edge of the toilet. Make sure that the seat stays flat on bowl rim. The knob should be in front of the toilet bowl. Align the handicap toilet seat over the bowl rim and push it behind as much as possible using your hands. Wind back the adjustment knob to tighten the bracket until you feel some resistance and then you can secure it. Do not use a wrench for this, just tighten using your hands. If the seat hits the toilet seat or lid you can keep adjusting till it fits or you may need to get a new seat. If the handles come separately, simply fit them in the installation brackets accordingly. Most handicap toilet seats don’t need much for cleaning. Just fill a bucket with water and some bleach. Use one part of bleach for every three parts of water. Take off the toilet seat and dip it in the water, then just let it soak in the bleach water for a few minutes and scrub until the seat is completely clean. Doing this once a week should be enough. Regular handicap toilet seats increase the seat height between 2 and 6 inches. The overall elevated height needed depends on the stature of the user. 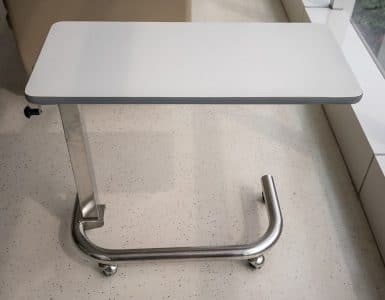 While figuring out the height adjustment, it is necessary to choose a height that will let you feel safe and secure, so make sure your feet rest comfortably on the ground. You can also choose a high toilet for seniors directly! For someone who requires a handicap toilet seat for a small period of time and doesn’t need much help using the toilet, there is the choice of an unlocked handicap toilet seat that sits on top of the toilet and is not locked or screwed in. With such a seat, make sure that it is not completely fixed to the toilet which can be a safety issue for persons with limited mobility or more dependence. For those who need a handicap toilet seat permanently, a raised toilet seat that can be locked in place is advised. Since they are completely secured onto the toilet, they give a safer option for those that have less stability on their own. Handicap toilets are available in different sizes and shapes. It is necessary to ensure that the product you buy is the perfect fit. Make sure you get the right measurements before purchasing a handicap toilet seat since many shops do not take any returns once the seat has been installed. Figure out if your toilet seat is regular or elongated, and get a seat that is made for the type that you have. You should know the weight capacity of the user who needs the seat so that you can choose from other bariatric handicap toilet seat options. You can also get an elevated toilet seat with padded provisions for comfort unless you want an easy-to-clean seat with no padding. Get whatever you think is the best-raised toilet seat for seniors according to your needs. After comparing and contrasting the different products based on their look, design, features, type, pros, cons and price, we’ve decided that the Essential’ Elevated Toilet Seat – Medical Supply with Arms is the best-raised toilet seat for elderly and handicapped persons. With its amazing weight-bearing capacity, soft comfortable arms for support and curved design to accommodate and support all people, this is definitely an ideal choice for old and disabled individuals who need all the help they can get. Last update on 2019-04-24 at 06:24 / Affiliate links / Images from Amazon Product Advertising API. Nothing on this site should be construed as medical advice. This website is for informational purposes only. Mobilitywithlove.com is a participant in the Amazon Services LLC Associates Program, an affiliate advertising program designed to provide a means for us to earn fees by linking to Amazon.com, Amazon.ca, Amazon.co.uk and affiliated sites. Amazon and the Amazon logo are trademarks of Amazon.com, Inc, or its affiliates.